“Russia without Putin” is more than a slogan. It’s an analytical claim. Vladimir Putin, 2018. Photo CC BY 4.0: Kremlin.ru. Some rights reserved.A review of Tony Wood, Russia Without Putin: Money, Power and the Myths of the New Cold War (Verso Books). Indeed, this black and white picture might be convenient, but it is far from reality. Tony Wood’s new book has moved beyond stereotypes in an effort to explore the multiple social dynamics taking place in Russia. Here, it is worth clarifying that “Russia without Putin” is not a reference to a well-known slogan of the Russian opposition that calls for Putin’s dismissal. Instead, it is an analytical claim: Russia and Russian society should not be reduced to Putin’s personality and presidency. In a sense, it is quite ridiculous that this argument has to be made in the first place, since nobody associates the agency of all American citizens with Donald Trump. However, it is the kind of generalisation that scholars, political leaders and journalists like to apply to non-western countries, supposedly less advanced than the US or other self-declared democratic states. Actually, Russia without Putin focuses less on Russian society than on the ruling system, which cannot be categorised as a pure dictatorship or authoritarianism, though both aspects can be part of it. The system is a mix of democratic appearance and capitalist substance, a clever and intimate intertwining of business and the state, profit and power, with “each sustaining and defending the other”. Despite all the critiques denouncing the comeback of the Soviet economic order under Putin, the truth is that Putin continues Yeltsin’s policy of liberalising the economy for the benefit of a few leading capitalists. If the names of some of these happy few may have changed in recent years, the principle remains the same: Russia’s power structures serve as an instrument for people close to them or some of the powerholders to exploit the wealth of the country for their own benefit. Wood’s second thesis is unusual, and concerns the continuation of the Soviet legacy. For pro-reform scholars and politicians, this legacy is viewed as hindering the development of the market economy and capitalist democracy in Russia. This legacy is often presented as having been revived under Putin (who often addresses his speeches to “hard working and patriotic common people”), while Yeltsin is supposed to have struggled against the Soviet order. By contrast, Wood argues that the Putin regime is far from being the triumph of statism. If the state is more present in Russia today, it is more as a kind of private corporation that extracts profit from national economic resources. Wood also argues that a second false evidence is that the Soviet past hinders market reforms. A closer look shows a different picture. In fact, the Soviet past, according to Wood, can “facilitate the construction of the new capitalist order”. For example, the traditional role of trade unions in the Soviet Union as a transmission belt and instrument of discipline explained why they did not play an active role in resisting liberal reforms during the 1990s. I would also point to the role of the discredited past in deconstructing and rejecting all social identities ascribed under the Soviet system, such as the unmaking of Russia’s working class, which in turn hindered the potential of workers’ resistance to impoverishment and labour exploitation. The book also shows the inadequacy of clichés concerning Russia’s mythical “passivity”. Based on solid knowledge of multiple new studies devoted to social mobilisations in contemporary Russia, Wood deconstructs the myth of a passive Russian society (which is already difficult to defend, given that numerous research demonstrates the vivacity of grassroots social initiatives in the country). What remains problematic, the author argues, is the gap between mobilisations around social concerns and mobilisations for political goals, particularly the 2011-2012 “For Fair Elections” movement. This explains why the anti-Putin opposition remains so weak and lacks support from ordinary people, particularly in Russia’s regions. In this vein, Wood devotes several pages to analysing the political positions of Alexey Navalny, who is now Russia’s most prominent opposition leader. He concludes that Navalny’s programme is also far from the aspirations and concerns of ordinary Russian citizens. While this thesis may be right, it is not enough, in my view, to demonstrate the neoliberal essence of Navalny’s programme or his chauvinist positions on internal affairs (Navalny has come out strongly against illegal immigration, for a visa regime with Central Asian states, and previously participated in the annual “Russian March” event). It remains necessary to explain why a capitalist and chauvinist anti-Putin programme lacks popular support, as this is not obvious at all. Moreover, to be fair, we should recognise that Navalny is one of the opposition leaders who actually speaks about social issues and social inequalities. He is one of the few who travels around the regions and demonstrates consideration for ordinary people. Indeed, Navalny is among those who could bridge the gap between the social and the political agendas in Russia – though after two successful (in terms of audience) national days of protest against corruption and social injustice in 2017, he is now turning more narrowly political. 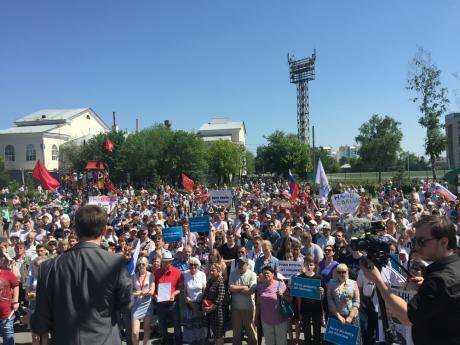 Navalny protest in Chelyabinsk, July 2018. Source: Navalny.com. 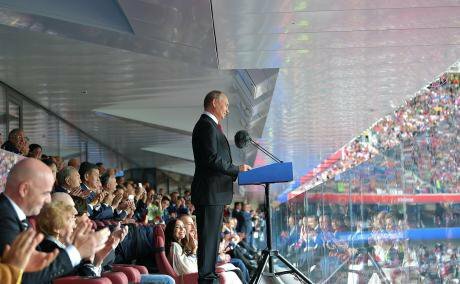 In any case, it is true that Russia needs a left-wing political platform that embraces social concerns and proposes an attractive political alternative. Moreover, in my view, there are some conditions already existing for the development of a left-wing movement, since the demand for social and economic justice is one of the most widespread claims that can be observed in Russia today, and one that is deeply rooted in the everyday life of ordinary people. However, one has to note that, for the moment, there is no left-wing political movement able to articulate these claims. To continue with critical remarks, Russia without Putin would have benefited from a more detailed analysis of what is currently happening in the depth of the Russian society, which is politicising and changing at a surprising speed. But one can hardly complain about this: grasping social changes as they are happening is not easy, and requires long and time-consuming ethnographic studies. In any case, the purpose of the book is not to show a changing society, but to demonstrate that Russian society actually exists, and that the country is more than Putin’s kingdom. The book does this successfully, although readers could have benefited from more insights into the social fabric and real lives of flesh-and-blood people. However, this would have been the focus of another book. For Russia without Putin, the purpose was also to deconstruct certain clichés about the anti-western position of Putin’s Russia. Most western and Russian media, as well as popular commentators, increasingly discuss a “New Cold War” between Russia and the west. But Wood argues that, while there are increasing tensions between Russia and the west, the situation should not be categorised as a “Cold War” as there is no longer any ideological divide: neoliberal capitalism dominates on both sides of the divide. The author makes another important point when he shows that these tensions arose not because of Russia’s aggressive policy, but because of the west’s disrespectful ignorance of Russia international interests. It is already well known that the west did not respect any of its promises regarding NATO expansion into former Soviet states, especially towards Russia’s borders. The author also reminds us that Putin, in continuity with Yeltsin’s policy, long displayed pro-western, and especially pro-European, positions. It is the 2014 Maidan revolution in Ukraine that convinced Putin to change his policy. He reacted offensively to the threat of western intervention at Russia’s borders by annexing Crimea, thus demonstrating the country’s sovereignty to the Russian population, and denouncing the western “double-standards” discourse as the west acted in the same way in Kosovo. Yet what’s missing in Wood’s account of 2014 is the unpredictable role of mobilisation on the ground in Ukraine. Wood warns us that although Russia may no longer be a great power comparable to the Soviet Union, the country still represents a major factor of destabilisation in international relations. Despite the obvious unbalance of power between Russia and the west, particularly the United States, Russia is still willing to act as a powerful international actor. This means that popular and institutional forms of resentment are likely to provoke more, rather than less, unpredictable operations such as the annexation of Crimea. However, I agree with Wood that there is no ground for demonising Russia and its power to interfere in international affairs. As a kind of semi-joke, Tony Wood seems to warn the Americans to bother less about the Russians and Russian interference in their own elections, and more about their own society and the deeper reasons why Trump won the 2016 presidential elections. 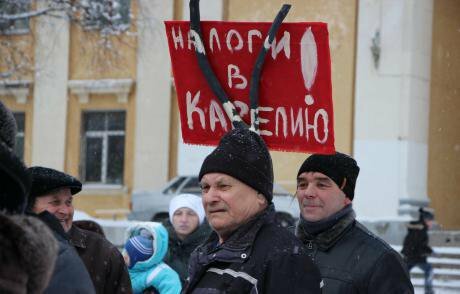 “Return tax revenues to Karelia” – protest in Segezha, Karelia, February 2018. Photo courtesy of the author. All rights reserved.While this observation is obvious and the appreciation of the current Russian system as weak or under threat is widely shared among informed scholars, one assertion is worth further discussion. The author, like many progressive intellectuals, univocally associates nationalism with conservatism, xenophobia and support for the national leader. However, my own research on everyday nationalism, as well as many others, shows that nationalism in Russia, much as anywhere else, is far from having only one form aligned with the ruling elite’s nationalist project. In Russia today, it appears that everyday nationalism “from below” differs strongly from the ruling elite’s version of nationalism, and takes many different forms and standpoints. Here, two remarks can be made if discussing the potential for social change. One is that the development of nationalism is also a channel of politicisation. The second is that the reinforcement of national sentiment can also open the horizon for a kind of social critique from below.